It's Pep Rally week and we are here today to share a sampling of the Paper Smooches December release with you! FIVE new stamps and EIGHT new dies will be available to purchase at 12:01am, Eastern time...on December 1st. You will find them HERE. To add extra fun to our blog hop...we are offering up prizes! I have two projects to share for the hop today, a card and a magnet. For both of projects, I used the new Polaroid dies. My card uses the polaroid frame die. First I inked the clouds directly onto the card front. Then I die cut the sunburst (Power Rays Die) from vellum. I inked the vellum a bit with yellow into look like sun rays. I love how the inked vellum looks over the cloud background! The sentiment is a die cut from Quote Tags. That font is so pretty:) I resisted the urge to add dots or sequins, and I'm happy I did:) CAS just makes me happy! My second project is a magnet using the camera die from the Polaroid set. This die is so intricate! I couldn't resist putting together a full-color version of the die cut. It was just a matter of cutting different colors and assembling. Just like the real thing, this die cut has a slit at the bottom where the picture is supposed to pop out of the camera. So instead of using my die cuts on a card, I decided to make a magnet picture frame. The slit of the die is just the right size to fit a standard wallet size school photo. I'm sure my son will be thrilled his mom put up his school picture, heehee! The best thing is that the picture is totally removable and you can change it up every year. I love your card but that magnet is awesome!!! Ow, so much to love here. The vellum sun bursts are amazing! That Polaroid magnet is the most creative thing I have seen in a while! That die would be great for scrapbook pages. Love it all!! Adore the magnet!!! How cute! Both are fabulous! Oh my goodness... What a darling and cute magnet and picture. Your son is very handsome! Great card and the magnet is so fun! That die... in a word darling!! love that magnet! happy thanksgiving! I love your sun rays - such a pretty card. Your camera magnet is SO clever. I like all the colors you used for the die cut in the camera, too. Wow to both of your projects, amazing, love the camera!!! Facebooked about the hop too!!! What a gorgeous card!! And, that magnet is adorable! Fantastic card! Love the polaroid die and the vellum! I love the sun and clouds! The polaroid is just genius. Happy Thanksgiving! Your card is fabulous and the magnet brilliant! You and PS = perfect recipe for inspiration! Your sun rays are perfect! and I love that cute little camera! I love your sun rays. So very pretty. And the camera card is so clever. I can always count on you to awe me with your talent. Both these projects ROCK! Oooo, I have the power ray die! Love how you used it! I posted on facebook and on my blog so others can join in the blog hop! What a jaw dropping gorgeous card, and your magnet is super cute! Those sun rays... a true JJ creation. Wow, I love the sun ray card and your fun design! So fun! I looooooove the camera, so cute! Congrats on the DT, well deserved! Fabulous projects! LOVE the magnet! Tweeted about the blog hop. Awesome card with the clouds and rays of sunshine! Love them both but especially the sunburst card. What an adorable card!! Love!! Love the sunburst card and the magnet is super cute. Love the technique with the vellum. Ohhh, the vellum is perfect on your beautiful 'hello' card and that Polaroid camera die looks amazing! You'd hello card is a very hopeful card. It would really cheer someone up. I am just amazed with both projects, JJ! Your sky card is so pretty, and your magnet is really fun! Thank you so much for your inspiration, as always! I hope you're having a wonderful Thanksgiving holiday with your family! First card…gorgeous. Second card…so stinkin' clever!! Paper Smooches? Yes, please!!! Wow! The sunshine card is stunning then I saw your Insta camera! That is amazing! Thanks for sharing. I agree -I think the vellum looks great, but the camera is fantastic! So intricate and clever! 2 for 1: delightful sunshine card and such a realistic camera. Thannks. Clever, clever, clever! 2 terrific works of art! Beautiful projects, especially the first one. The vellum treatment adds so much to the card! Lovely card and I just adore the magnet. Great idea. Thanks so much for sharing. Completely gorgeous projects! LOVE the polaroid camera - and that first card is stunning!!! The inking on the vellum is simply stunning! Such a 'small' touch that is so unique & YOU :) And that magnet - oh em gee, how awesome would that be for little Christmas gifties for grandparents? GENIUS, JJ! love blog hops with prizes..... this card was very nice. That is just way too cute. You're son is handsome! I am absolutely dazzled by your sun ray card!!! Totally awesome. The card is awesome!!! And I love the camera as a magnet!! You rocked the dies!! WOW- stunning!!! I love both your projects!!! Using vellum like that is pretty awesome! Love anything camera related so these card and magnet are wonderful. I FB about this release. I posted on my blog (Flickr account). Love the bright cheery yellow hello! I love that you can still see the clouds through the yellow rays of sunshine. Great work. I love this bright happy card! Oh your projects are to die for! I love them! Thanks for sharing--Happy Holidays! That camera is too much! Love it! These two are just AMAZING!!!! I am definitely wanting these items when they come out. I love your card such a fantastic CAS design. The vellum sun rays are fantastic. 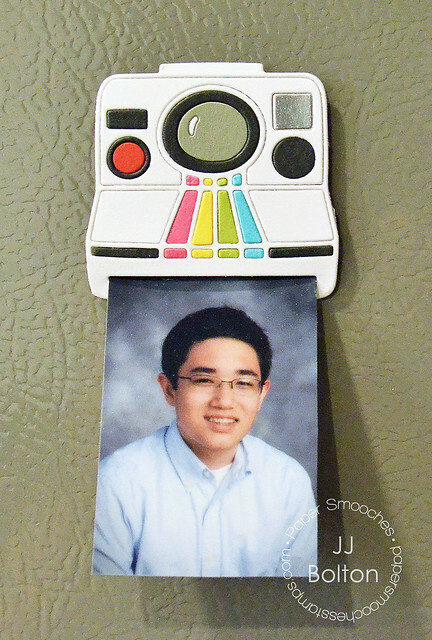 What a great idea to use the camera die to hold a photo on the fridge. You're a creative genius. your magnet is amazing! i love that die! Such clever uses! I just love these both! Love both of the cards, so pretty. Love the sun rays too. OK, I love the polaroid camera die. It is just so much fun and I love all the details, but that first card I LOVE!!! The inked vellum is right up my alley, totally gorgeous! Yay for being on the team too, you are awesome!!! Wow! Amazing card and magnet! 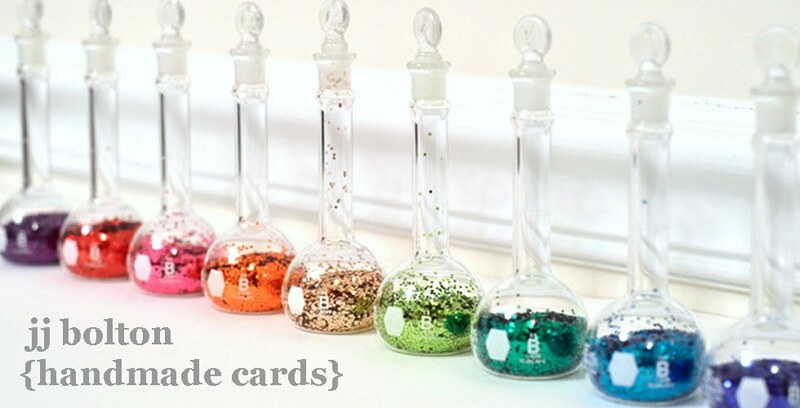 The use of vellum on your card is fantastic! Thanks for the inspiration! Wow, this is a beautiful card! I love the bright yellow and sun rays, thanks for sharing. I absolutely love your card and the effect of the rays of sunshine, and your magnet is so creative as well! Love the sunburst card! Thanks for the inspirations! Love the sunshine card - I need to remember that vellum is a friend. The Polaroid is such creative way to display photos; love it! Absolutely love the sunburst on your card!! I too love how the yellow on the vellum looks with the clouds background!! And OMG!! That magnet is too adorable!! Love them both!! oh my...both cards are awesome! Wow! Gorgeous way to do sun rays! Love that use of the die in the first card with the sun rays... for once I actually have all those items! Love your card and the magnet is such a great idea! I love the way you colored in the camera. The sun rays are way cool too. Great ideas. hehehe! Love the poloroid! Those sunrays are beautiful too! JJ you always amaze me! That sunburst card is CAS but pure genius...love the way the rays look cut in vellum. And your son is so handsome!! What a perfect use of that Polaroid camera die, so adorable! Wow, that card took my breath away. So beautiful!! LOVE the first card -- the sun rays over the clouds are gorgeous! The camera and polaroid card is also fabulous! This makes me look forward to summer! Both your projects are simply fab. Love your clever and intricate magnet - nice job! Your card is great too! Great cards. Great clever use of the dies. Super cool card & LOVE the magnet too JJ!!! WOW! Love your sunray card so much - on vellum with the inking, it is stunning! These are awesome! Thanks for sharing!! I love the sunshine card - it is awesome. And I adore the polaroid with photo you pieced! Those rays of sunshine on the card look brilliant, so clever how you have done this. I love the sunshine rays coming out! 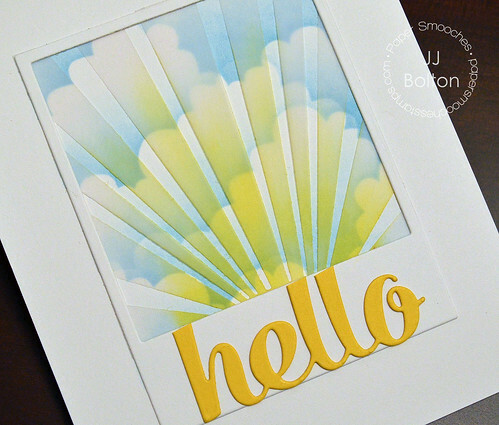 The yellow "Hello" die cut is gorgeous! Love the clouds and the vellum sun rays look fabulous! The camera magnet is awesome...I could fill my fridge with them! Thanks so much for sharing! Oh those vellum rays are amazing!! I posted the hop on FB!